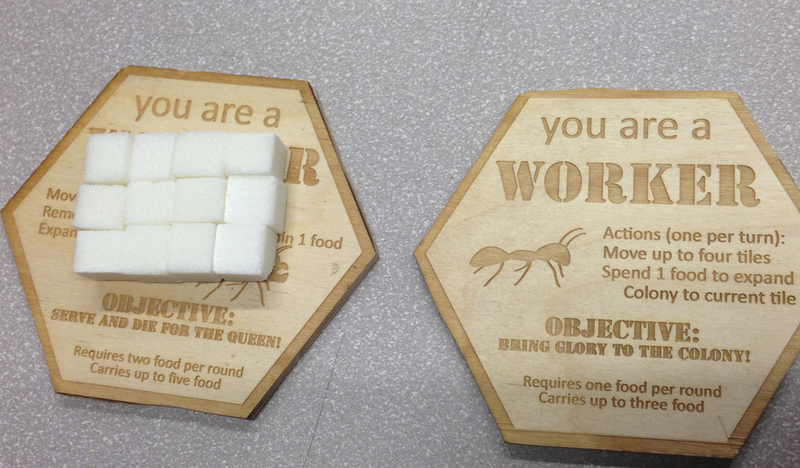 The Colony is a social game for 8-11 players exploring life inside an ant colony. Players slowly explore an expanding board, foraging to find food and sustain the Colony. A player or players are designated as traitors, but that information is not revealed publicly until halfway through the game. By slowly ramping up the drama, players get more and more excited as tensions build and the sugar cubes eaten increases. Based on how it played out in the testing sessions, I think the game has a good balance between strategic play and dramatic voting sequences. I'm pretty happy with where the project ended up, and am very pleased with the quality of the game pieces as well as the game mechanics. The gradual reveals in the narrative captured pretty well the structure I was intending, and moved the flow of the game along at a good pace. 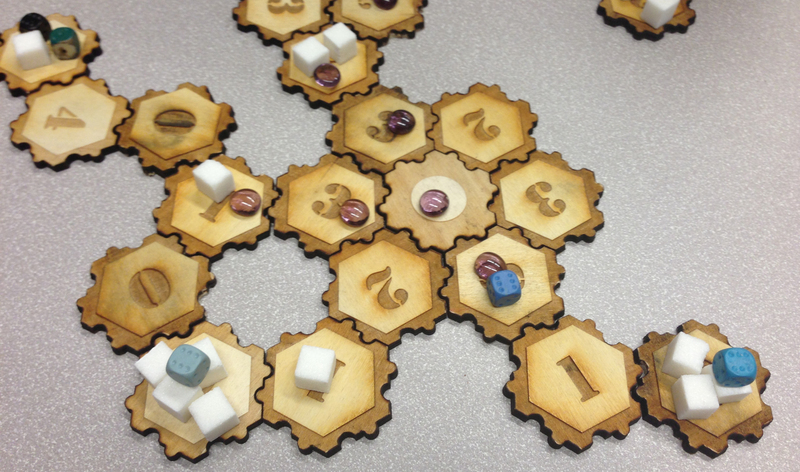 The Colony is played on a board of interlocking lasercut wooden tiles I designed. The board pieces are stacked face down, then, if a player would move into an empty space, a new tile is drawn and attached to the board. This keep the game mysterious and rewards exploration. Colored dice represent player pawns, and real sugarcubes are stacked onto the board to represent resources. Players are assigned role cards (also lasercut wood) at the start of the game, which they keep hidden. Role cards detail how each player moves and constructs tunnels, as well as how many resources they cost the colony to support. Only the queen's role is public.